​​​​​​It was a short note. “Howdy! I am a student at Texas A&M and I'm wanting to start a small passive investment into real estate. I am also a beginner and know very little about real estate but I'm eager to learn. Can you guys help me out?" Here are a few things for you to think about as you pursue real estate investment. What type of property interests you the most? Look at the buildings around you and figure out what looks interesting to you. Land and buildings require a great deal of care to keep them generating income, so you better like what you are managing. Get a job working for someone managing the type of real estate that interests you most. You need to learn how the asset works and how to take care of it. I cannot emphasize this enough. It will save you from making many mistakes. Managing real estate isn't a “passive" job. You need to be ready 24/7 to take care of it and serve the tenants who are paying you to be in your space. Get an internship working for a firm managing the type of real estate that interests you most. The experience will help you a lot when you are in the MRE program. It will significantly increase your odds of getting a great internship in the program. Always conduct yourself with the highest ethical standards, and do your very best to serve people. It will open doors to great real estate opportunities. Still, it beat the duck-and-cover strategy Still, it beat the duck-and-cover strategy David Jones Jones, D.
​​Sixty years ago, the Cold War had Americans looking down, as in underground. Fearing nuclear fallout from Russian atomic bombs, some Americans put their survival hopes in belowground shelters. Shelters ranged from basic backyard models to elaborate homes with every amenity possible. Some were partially buried. Some were much deeper. When I saw that ​a 1960s fallout shelter is for sale in Las Vegas for $18 million, I had to learn more. My sister owned one of the basic models. 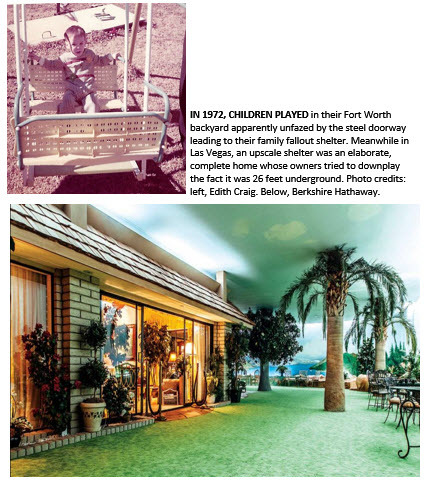 It came with a used Fort Worth home she purchased in 1970. The house was discounted because of the shelter's large aboveground concrete dome. Although the dome was covered in soil, nothing would grow over it, and it dominated the backyard. An air vent pipe accentuated the mound. A metal, ground-level door was the entrance to the Fort Worth shelter (see photo). Although the door had a spring, my sister said it was too heavy for her to open. She describes the entry stairs as “very steep." The shelter slept six in bunk beds, three on each side of a single room. She said it reminded her of a submarine berth like those shown in World War II movies, except hers had a slightly wider aisle. Her basic model had a water-purification system. The portable toilet was in a separate, enclosed area. The kitchen consisted of a food pantry and a can opener. A generator provided electricity. Air was filtered. My sister said her shelter was more useful as a storm shelter. There was consolation knowing her family had a place of refuge should a Texas tornado come their way. Furthermore, the large dirt mound offered the best place in the neighborhood for kids to play king of the hill. Just for the record, not many Americans had fallout shelters. A survey at the time showed 67 percent of people thought a family shelter was too expensive. According to gizmodo.com, only 1.4 percent of Americans had a fallout shelter in 1962. ​Apparently, the fear of what the neighbors would​​​​ think of a fallout shelter outweighed the fear of what the Russians would do. Nearly 60 percent of Americans surveyed said that if the Russians attacked, defending the shelter from neighbors would be the biggest concern. ​​​​The Real Estate Center’s research team had its monthly pow-wow earlier this week. Naturally, much of the discussion focused on what to expect from the Texas economy this year. Overall, the outlook is generally positive​ but with a caveat. Center Chief Economist Dr. Jim Gaines said the economy should continue to see growth but at a slower rate than the state has experienced in recent years. “Texas is doing pretty good, but I think we’re going to see a slowdown across all Texas markets, including employment levels,” he said, adding that the economy will still remain positive. Meanwhile, at the national level, he said GDP growth could reach its highest level of the last six years. At the Texas Realtors’ winter meeting, National Association of Realtors Chief Economist Lawrence Yun said interest rates won’t do much this year. They’ll probably stay in the low 5 percent range. Yun said housing affordability will continue to be a big issue for the U.S. Meanwhile, in Texas, home price growth is slowing. However, the median square footage in Texas homes has been dropping, which means smaller homes are on the market and could be a factor in declining sales prices. Activity in the state’s energy sector will be neutral, Dr. Gaines said, with oil prices neither rising nor dropping significantly but staying around $50/barrel. Research Economist Dr. Harold Hunt pointed to a survey from the Federal Reserve in which 29 percent of executives from 160 oil and gas firms said they expect prices to rise to between $60 and $65. Mining and logging remained the state’s top industry in December 2018, said Research Economist Dr. Ali Anari. That sector created over 40,000 new jobs year over year. For more 2019 projections from the REC research staff, read our 2019 Texas Housing & Economic Outlook​ report, now online. ​​​​ The low rate of U.S. productivity growth—and, consequently, the fall in potential GDP growth—in the past eight years is unprecedented. Technological advancements can help reverse that trend, but it takes time to see their benefits. For example, productivity gains from computers in the '80s didn't show up until the '90s. Recent data do not show the current wave of innovations in robotics, artificial intelligence (A.I. ), and other fields as having any greater impact on business methods and techniques than earlier industrial revolutions did. In fact, automation—as exemplified by computer numerical control machinery, industrial robots, and A.I.—has raised concerns about widespread joblessness. For centuries, people confronted with labor-saving tools and machines have been concerned not only about the effects these new tools and machines would have on their incomes, but also on the nature of their work and lives. ​But like past technological waves, automation will bring new jobs that increase labor demand, wages, and employment. The negative effects of automation will be counterbalanced by the creation of new tasks in which labor has a comparative advantage. If the benefits of introducing new tasks outweigh the negatives of replacing labor with machinery, the result will be higher wages and employment. Currently, the implications of automation for wages and employment are not entirely understood. Workforce education plays a pivotal role given that industries that are relatively education-intensive have greater value and show faster productivity growth. If productivity growth continues to depend on automation instead of labor, the relative standing of labor, together with the task content of production, will decline. The creation of new tasks and other technologies raising the labor intensity of production and the labor share are vital for continued wage growth commensurate with productivity growth. ​Recently I had the opportunity to attend the American Economic Association’s (AEA) annual meeting in Atlanta​​​. The meeting brings together economists from around the world, representing different fields and sectors, to discuss monetary policy, technology, globalization, and more. One discussion panel I attended was the Federal Reserve Chairs Joint Interview. The panel included current Federal Reserve Chairman Jerome Powell and past chairmen Janet Yellen and Ben Bernanke—three important economic figures who played pivotal roles during the Great Recession and afterward. Here are some takeaways from the discussion. The panelists had no serious concerns about current U.S. economic conditions, nor did they see any red flags pointing to high inflation due to wage increases. This year, they are expecting slower U.S. and world economies, but they also expect the U.S. to break its record for economic expansion this summer. They noted conflicting signals between data and the financial markets, possibly due to financial markets pricing downside risk ahead of future results because of policy uncertainty generated by the federal government. As Bernanke likes to say, there is no “Wile E. Coyote” moment in the short-run horizon for the U.S. economy. The current Federal Reserve chairman went on to say that monetary policy formulation is quite flexible and is data-dependent. With respect to nontraditional monetary policy tools, they see both forward guidance and quantitative easing as being successful in overcoming the Great Recession. Neither led to hyperinflation or asset bubbles. Also, the Federal Reserve’s ability to become more flexible in making changes based on the underlying data were and are important. In addition, transparency and communication improvements to the public played an important role in overcoming the financial crisis. All three economists agreed that the Federal Reserve's monetary policy decisions are best made without political influence. Janet Yellen and Ben Bernanke added that comments made against the Federal Reserve and its present chairman by the current administration undermine confidence in the Federal Reserve to achieve its goals. When asked directly if he would resign if asked by the president, Chairman Powell answered with a simple and convincing "no." They argued that the financial system post-Great Recession is more resilient to future crises because of banks being more capitalized, the implementation of stress tests on the banking system, supervisory innovation leading to the public's understanding of what is happening, and better risk management. But there is more work to be done in the area of macroprudential​ tools and possibly creating a financial stability board that looks at asset prices and caps loans to risky markets. There is a lack of tools in the U.S. compared with other countries. Canada, for example, has a systematic institution that supervises asset prices and has emergency lending tools. The panelists also discussed the relationship between high inflation and low unemployment (known as the “Phillips Curve”) and how this relationship is currently weak, meaning wage increases would not cause inflationary pressures as labor markets heat up. Regarding balance sheet normalization, they agree that the balance shrinkage by the Federal Reserve has a small effect on financial markets. Powell said they currently don’t believe balance sheet normalization has an effect on financial markets, but if it did they would change policy formulation. ​​​Dr. Torres will share more insights from the AEA conference in upcoming blog posts. ​​I have been reading a lot lately about disruption of companies and whole industries. One statistic stands out. About 90 percent of Fortune 500 companies that existed in 1955 are gone. They’ve gone bankrupt, merged, or still exist as shadows of their former selves and are no longer on the list. The life expectancy of companies and industries continues to shrink. The pace of disruption is increasing. Innovation and future-proofing are the means to survive. The Center is adapting in this environment as well. The legislature laid out our mission very clearly when they created us. That mission is still deeply relevant: “Conduct studies in all areas related directly or indirectly to real estate and/or urban and rural economics and disseminate results and findings.” In other words, conduct the research and get the information into the hands and minds of Texans (consumers, real estate professionals, homebuilders, commercial building contractors, attorneys, homebuyers, home sellers, policy-makers, and a host of other stakeholders). Though our mission (the why of what we do) has not changed, our strategies and initiatives have and will continue to evolve. Here are some examples. We now focus almost exclusively on forecasting—​looking forward and anticipating future business, economic, and real estate activity. Our researchers once worked on projects in isolation. Today that is rare—​collaboration is the new normal. Drawing on the synergy of bright minds and expert observations of many enriches our results. We now think of ourselves as explorers looking for new patterns in business and economic fundamentals that drive real estate activity and whole economies. The underlying fundamentals may have changed or at least the priorities of those drivers shifted. We don’t yet know, but we are on the hunt. Finally, we are experimenting with the best ways to get our findings into your hands. We now think in terms of data visualization, geospatial analytics, and presenting data at the most usable and meaningful local level we possibly can. We are using every media at our disposal to reach Texans. I’m sure the coming year will bring new, exciting contacts with our ever-expanding audiences. Stay tuned. Statistical evidence shows that oil prices have a significant effect on Texas land prices. Specifically, although the impact is not immediate, higher (lower) oil prices tend to boost (dampen) Texas rural land prices in the long run. This impact suggests that changes in the direction of oil prices may signal a long-run shift in land market trends. 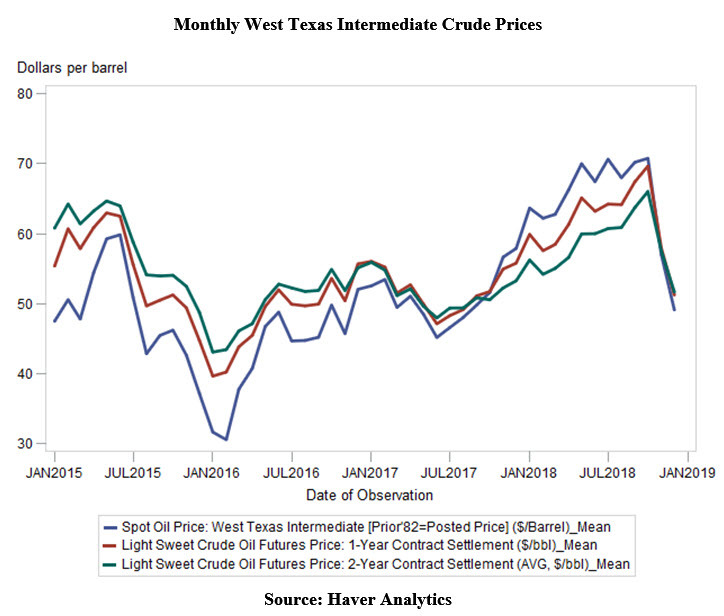 The chart shows current spot prices (blue line) for West Texas intermediate crude oil along with contract prices for delivery of that oil in both one (red line) and two (green line) years. When prices for future delivery range above (below) current spot prices, market participants expect prices in the future to range higher (lower) than current prices. From 2015 through the beginning of 2017, markets anticipated rising oil prices. However, markets began to anticipate falling oil prices beginning in second quarter 2017​. The difference between current and futures prices has begun to expand, signaling that traders anticipate declining oil prices. Do these expectations portend a reversal in Texas land price trends? The answer is maybe, but . . .
First, other forces also affect land markets. Income expansion, interest rate dynamics, and history also play substantial roles in land market trends. Second, responses to oil price changes have had varying impact on land prices in the past. Finally, futures prices rely on guesses by market participants about future realities. Actual results likely will differ from those projections. Anticipated oil price erosion may not become reality. In the final analysis, the significance of this chart lies in the revelation that market perceptions about oil prices have shifted. The factors that contributed to that shift may influence thinking among land market participants.